Owning any retail or digital version gives a one-month subscription and permanent Preferred status; see Features for details. Bitraider can cause major network and performance issues, including having to redownload the game every time you play. 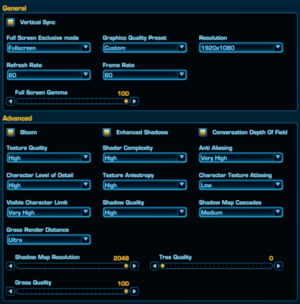 Use Widescreen Fixer to fix HUD placement. Edit configuration files to increase global UI scaler beyond 1.25. Calculated by desktop resolution, not render resolution. See WSGF. Medium uses FXAA, High uses x2 MSAA, and Very High uses both. There is no Low option. TrSSAA has issues and TrMSAA doesn’t work. Framerate is capped at 111 fps. The game uses 5.1 or 7.1 if available. No in-game settings. Can be changed in Settings. Turning off shadows drastically increases the performance of the game, and can normally change the frame rate from unplayable to acceptable. Type /stuck in the chat window if your character gets stuck in the environment. 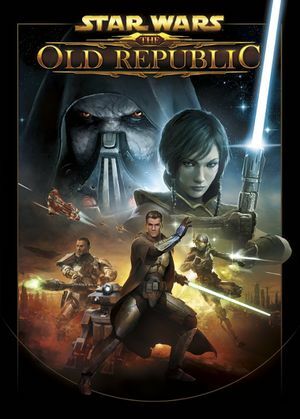 This thread specifies how to implement a RAM Disk with Star Wars: The Old Republic. ↑ Verified by User:SirYodaJedi on May 20, 2018 at 1920x800 resolution.